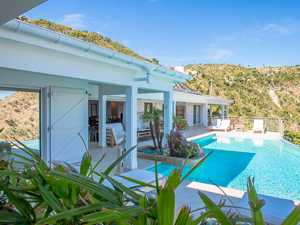 Villa UJV 192, also known as Villa Ancre de Gouverneur, is a dramatic 3 bedroom villa located in Gouverneur, St Barts, offering an amazing ocean view over Gouverneur beach, Nevis and St. Kitt's. The living room has comfortable sofas and is well-equipped. All the bedrooms are air-conditioned and face the dramatic ocean view. The Master bedroom, decorated in Caribbean style with pink tones, features a 4-poster king size bed and an en-suite bathroom. The second and third bedrooms are completely private from one another, but can connect, making villa UJV 192 a great option for families or couples. Bedroom 2 is decorated in a romantic style with blue tones and furnished with a half-poster king size bed and an en-suite bathroom. Next door, the third bedroom has twin beds that can be pushed together as a king, as well as an en-suite bathroom. The large terrace has constant breezes. The terrace surrounds a large infinity pool overlooking the ocean, and features lounge chairs for relaxing and admiring the view. A covered outside dining area is the perfect place to host a private dinner with friends. This villa is ideal for guests looking for breathtaking sea views, privacy, and close proximity to Gouverneur Beach.